Abdul Moimême was born in Lisbon, in 1959, moving at an early age to New Mexico and later to Dublin, Ireland. He began studying the guitar at the age of 11, studying under various private teachers, in Madrid, Spain. In the 90’s he began studying the tenor saxophone with Patrick Brennan. In this period he became actively involved with Lisbon’s improvised and alternative rock scenes, performing frequently with the Variable Geometry Orchestra since it’s creation in 2003, as well as with various other local projects. 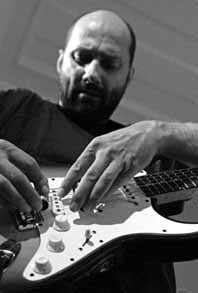 In 2006 he created Freemusic (http://freemusic.podomatic.com), a space exclusively dedicated to the promotion of Portuguese improvised music.